AAI Recruitment Notification 2017: Airports Authority of India (AAI) recently released two notifications, which is related to its 2017-18 recruitment in North Eastern Region. 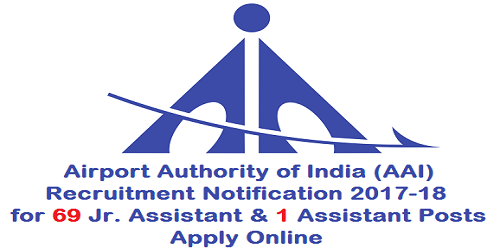 These recruitment notifications of Airports Authority of India (AAI) are for the posts of Assistant NE-5 Level and Junior Assistant (Fire Service) NE-4 Level in North Eastern Region. Total number of vacancies available is 70 in that 69 vacancies for Junior Assistant post and 1 vacancy for Assistant (Office) post. Airports Authority of India (AAI) is inviting all the eligible candidates who are Domicile of Assam, Arunachal Pradesh, Manipur, Meghalaya, Mizoram, Nagaland and Tripura states to apply for this recruitment through online. The online Applications are available in the official website of Airports Authority of India (AAI) https://www.aai.aero/en/careers/recruitment from 16th December 2017 at 5 PM. The candidates, who are interested in this recruitment of Airports Authority of India (AAI), first go through the entire details of the notification. As per the Assistant (Office) and Junior Assistant (Fire Service) post requirements who are eligible and interested can apply for it through online from 16th December 2017 to 15th January 2018. In this article we provided all the necessary information of both recruitment notifications of Airports Authority of India (AAI) for Assistant (Office) post and Junior Assistant (Fire Service) post, go through it or download the official notification by clicking the relevant link. - Graduate with typing speed of 40 words per minute with computer knowledge. - 2 years relevant experience in the concerned discipline subject to trade test. Note: once paid application Fee will not be refunded and the Fee is accepted through online net banking/Credit Cards/Debit Cards. 1. Computer Based Online Written Examination: Minimum Pass marks will be 50 out of 100 for General/OBC and 40 out of 100 for SC/ST candidates. 1. Computer Based Online test: Minimum Pass marks will be 50 out of 100 for General/OBC and 40 out of 100 for SC/ST candidates. - Chest around 81 Cms Normal and expansion minimum 5 Cms. - Weight not less than 55 Kgs. Distance Vision: 6/6 with each eye without glasses. Colour Vision: Should be normal as determined by Ischihara’s Charts. Field of Vision: Each eye should have full field of vision as determined by Confrontation test. Refractive Error: No Refractive error is Acceptable. 4. Driving Test: this test will be conducted on Light Motor Vehicle. Online applications are opened from 16th December 2017. Closing date for online applications is 15th January 2018 up to 5 PM. Last date for Application Fee online Payment is 17th January 2018 up to 5 PM.